“Yes, there is a lot in this book, and I enjoyed every bit of it. I enjoyed experiencing life in Arizona shortly after it became a state and traveling down unpaved roads that bear absolutely no resemblance to the streets they are today. The inclusion of Hobart Bosworth and his crew who were filming a movie called “The Yaqui” on the streets of Tempe was a very special treat. The author is also adept at bringing in bittersweet moments and feelings of dread when the date for America’s entry into World War I draws ever closer, or when Shaw begins planning the things he and Alafair can do when the children are all grown. I’ve become quite attached to all the Tuckers, and I care about what may happen to any one of them in the future. “The history embedded in this informative story reveals more than I ever knew about the Southwest just before World War I. Facts are woven into the story line with ease, and add depth to the times depicted. 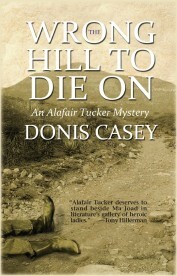 The Wrong Hill to Die On is a really good read.” Mary Ann Smyth for Book Loons , Nov. 2012.